When we heard the synopsis of the book The More You Ignore Me by Author and Comedian, Jo Brand, after hearing it was to be adapted for the big screen, we quickly obtained a copy. We only heard of the film being made, as it made a fair bit of coverage in the UK as Sheridan Smith was to be cast as Gina Wildgoose, a mother prone to psychotic episodes and we are fans of her. The book follows Gina’s daughter, Alice (Ella Hunt to play her in the movie) and how she copes living with her unpredictable mother and her hippy-like father, Keith (Mark Addy has been cast) as well as Gina’s crazy drunk parents and uncles (To be played by Tom Davis & Tony Way) who are best described as criminals. Gina is in and out of the life of Alice, due to her mental illness, which we first really see its full effect on her, when she becomes obsessed with the local weatherman, which culminates with her climbing naked onto his roof, with Alice’s pet guinea pig! Unlike Gina, he comes from a not so crazy family background, and it is clear his parents do wish he was with someone other than Gina. Alice does not have the best of school life either, being from the known ‘Wildgoose’ family she is often judged and bullied. Her life drastically changes when watching the music show Top of The Pops and sees The Smiths play and she is drawn to the mysterious front man Morrissey, who she believes can help her out of the chaos that is her life. This really is a great read, you can really feel for the characters, yet they also provide some great laugh out loud moments. Alice has plenty of near misses as she tries to see The Smiths and Morrissey perform, we also see the results as she writes to him and then the total chaos when Gina also discovers him! It is no wonder this has been picked up to be a film as it should be excellent, especially with the cast. Sheridan has always been fantastic on stage and our TV screens, showing she can do drama with comedy from the likes of Cilla; The Big C and Two pints of lager so we are sure she can bring the madness of Gina to life whilst still keeping our sympathy for her. We last saw her on the big screen in The Huntsman: Winters War (review here) but we believe this could finally see her acting from the small screen and stage finally recognised on the cinema screen. The cast also includes Sheila Hancock; Michelle Collins; Ricky Tomlinson & Jo Brand herself. 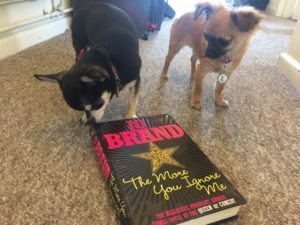 You don’t necessarily have to be a fan of Jo Brand’s comedy to enjoy this book and we do thoroughly recommend a read before seeing the film.